I have a lot to learn, but I’m making the journey. Slowly, but surely (I hope). One thing’s for sure, I am learning a TON from painting every day. I never thought it would make such a difference, but it definitely helps to reinforce what I’m learning by making a daily practice of watercolor. I’m learning to build a background, and gradually working on composing my own paintings from photographs. Colors (all M. Graham unless noted): raw umber, burnt umber, raw sienna, burnt sienna, sap green, viridian green, cerulean and ultramarine blue, alizarin crimson, cadmium yellow, wn rose madder, cotman dioxazine violet and cotman mauve. Happy Wednesday. I hope you make something beautiful today! Oh, stop. You’d never sit down at a piano and expect to perform a symphony. I’m preaching to myself too. I’ve become hooked on drawing too, but mainly because I’m hoping it’ll help me produce better paintings. Didn’t work too well in this case of the cottage about to collapse to one side lol! But anyway. You have bags of talent, you just have to give it time to develop. I think you’re doing amazingly well for someone who’s never been into art, really. You’re all about enjoying the journey, so I don’t have to tell you. I went to the beach last year about two weeks after buying some very inexpensive supplies for watercolor at walmart. I thought I could produce (real) art! What was I thinking?! It was not to be, but I have some WC sketchbooks from my time there and those paintings have the sea in them. I was mostly just doing abstract backgrounds for art journaling (once I gave up painting waves and the sky lol), but they are beautiful in their way. What comes will come and in its time. You taught me this! It’s all good. 💜 And honestly, anything at the beach is more than good!! Good morning Laura, Charming painting today! I just watched the video with Joanne Boon Thomas. It was very instructive. She has a great teaching style. Thanks for the link. I like that loose style. I’m not nearly as loose as she is, but I did let my flowers bleed into the cottage and I liked that. I never stopped to dry anything either. I like painting that way. Just keep going and hopefully it all blends. That is definitely one cozy cottage…all those warm colors are comforting, and the green in the back makes the cottage pop! Easy chair, cup of tea, good book…very inviting. BTW, I’m quite enjoying “The Sound of a Wild Snail Eating”. My daughter reminded me we had pet (water) snails long ago as I was telling her some of the things I had learned from the book about snails! Awesome! Loving that book! (Still not finished). Glad you’re enjoying it! I love the illustrations. Yes me too. Who knew snails were so interesting? I think anything in the natural world can be interesting if the right person tells the story. I’m fascinated continually by the way the natural world works (if humans don’t muck it up too badly). Laura, your lovely cottage is one of my favorites. There’s something about them that stirs up cozy feelings. When I posted a picture of our cottage style house, that’d I’d painted, it got the most attention out of all my watercolors. I’m only a beginner. You’ve inspired me to get going on another one. Happy Wednesday to you too Laura. 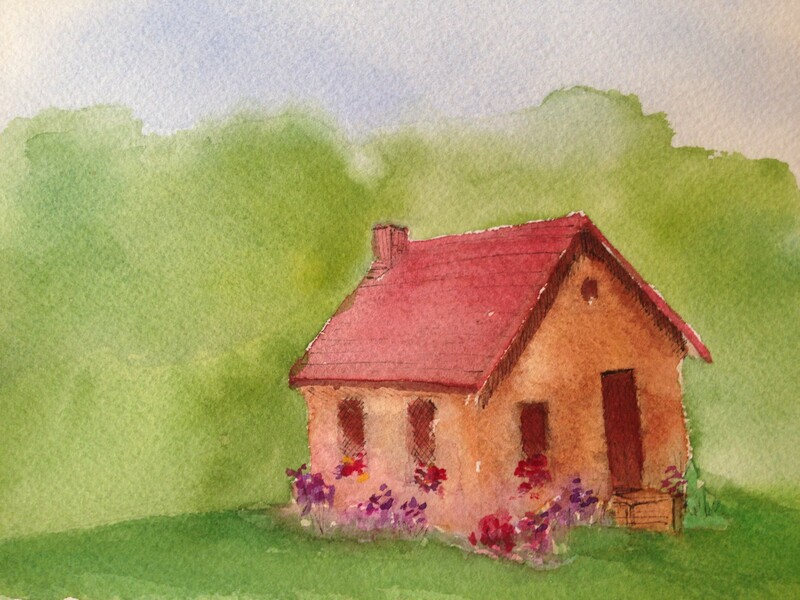 Charming and wonderful to see your cottage watercolor. Nice work with managing your values, as the house and foreground stay up front – lovely work on the flowers and sky too! It’s wonderful to see your workings and progress – you’ll never regret this time. Thanks as always for your encouragement, Mary! Aww thank you Fabio!! Your encouragement always brightens my day! I hope the sun shines warmly in SD for you today, my friend! well done Laura 🙂 great progress on your art journey! you’re welcome! very good 🙂 step by step, hey, have you ever read the quote by Calvin Coolidge about persistence? google it. I have loved it ever since I first started watercolours!! Oh and I can’t resist asking when did you start watercolor? Did you find it later in life, or have you been splashing in paint puddles for some time lol? Your cottage is sweet! I’ve been watching the FrugalCrafter everyday, and have saved a couple of her latest tutorials to try. I probably need to be more like you and paint everyday in order to improve. Your work is lovely.